The annual Network Ireland Business Women of The Year Awards are scheduled for September 10 this year. Among those attending will be three award recipients from the Network Galway awards which was celebrated in May. Geraldine Curran - restaurant manager from Capone’s Restaurant, Bernie Dempsey - founder of BD Recruitment, and Mary Creavin Ludden - managing director at Cregal Art Ltd, are the three who have been selected from the network Galway branch to progress to this event. They will be recognised in the categories of Employee Business Woman of the Year - Geraldine Curran; New Business of the Year - Bernie Dempsey; and the Self-Employed Business Woman of The Year - Mary Creavin Ludden. Geraldine Curran, as part of her function as a restaurant manager, commands the complete management of the restaurant. She spearheads the training and recruitment of existing and prospective employees. Another one of her primary duties to the Capone Restaurant on Kingston Road, Galway, is to source food suppliers who offer the most affordable rates. Mary Creavin Ludden is the managing director of Cregal Art Ltd. This establishment boasts a forty year long tradition for facilitating competitive prices, distributing quality arts and crafts goods, and providing a swift delivery service. Cregal Art Ltd is also a commercial unit which stocks picture framing supplies. Bernie Dempsey is the orchestrator behind the BD Recruitment initiative after noticing a demand for a greater individual and targeted approach for both clients and candidates. BD Recruitment is a culmination of Miss Dempsey’s work experience in the recruitment sectors in Ireland and England for twenty years. The organisation offers a full consultancy to graduates, professionals and employers through its website. BD Recruitments is also powered by a team of committed and focused specialists in IT, technical and engineering, sales and Marketing, HR and training, accountancy, administration, food and pharmaceutical, and factory and warehouse recruitment. The event will be staged in the D Hotel, Drogheda, Co Louth and TV3’s Xpose and The Morning Show presenter Sybil Mulcahy has been confirmed to host the ceremony and present awards to the finalists from each individual branch. 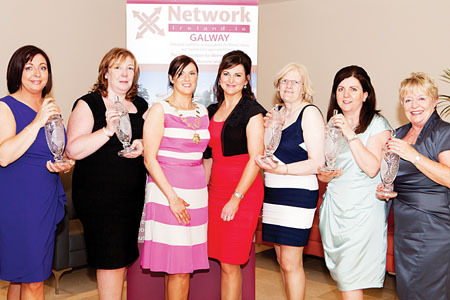 The 2012 Business Women of The Year Awards will be preceded by the Network Ireland National Conference in the Droichead Arts Centre, Drogheda, Co Louth. This year’s theme for the conference is ‘Work Well, Live Well’. A team of inspirational speakers will address the audience on the night including Orlaith Carmody, Noel Toolan, Michael Comyn, Ciara Conlon, Fidelma Green, Samantha Kelly, Laura Armanda, and Buch and Barbara Faibish. Tickets for the event can be sourced on the official Network Ireland website www.networ kireland.ie with tickets priced at €95 for Network Ireland branch members and €125 for non Network members.